The mountains are almost more beautiful and impressive than the ruins are. The hike up to Wanyu Picchu is great, and is quite similar to angel´s landing in Zion, Utah, only it´s green and there are really old precariously perched ruins to wander through. 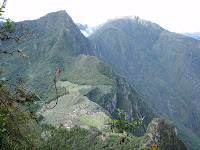 I came to aguas caliente (macchu picchu peublo) the back way. Bus from Cuzco to Santa Maria, then taxi to the hydroelectric dam. After that it´s just a 2 hour walk to aguas caliente. I walked up to Macchu Picchu at 5 and beat most of the buses. I also passed about 30 hikers on the way. Yeah campcraft! 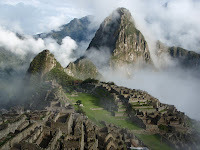 So glad that you got to Macchu Picchu. Must have been wonderful at 5AM. Maybe we'll go someday. Hi Steve. 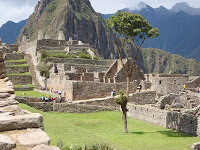 I envy you enormously to be traipsing around at Macchu Picchu. Hope you're well. Solstice Party is Sunday, the 21st. Sorry you won't be here.